Switching to the right call sound while hunting coyotes can spark the predator's curiosity, bring it straight to you and allow you to easily finish the job. You’ve obviously heard the phrase “curiosity killed the cat.” Its meaning extends far beyond the feline lineage of fauna populating the planet. In addition to curious Homo sapiens falling into the trap of curiosity the phrase also has ample implications in the predator world, even beyond the cat classifications. It’s no secret interest in predator hunting has exploded. You see it in the ever-increasing product selection at your favorite sporting goods store and also in the field. I’m reminded of it every weekend by the sight of boot and tire tracks on public parcels at my coyote haunts. If I do a setup or two with prey in distress in the mix and don’t experience any coyote results I then begin thinking about curiosity instead of sending a dinner-bell message. I also re-evaluate my message if I pull into a public parcel and see old boot tracks. It’s likely the predator-hunting predecessors used a message of mayhem. On a recent coyote hunt, I targeted a public block of land that had road access through the heart of it. Tire tracks indicated someone had been through the area and my hunch was road hunters hoping for coyote, drive-by success. With that in mind, I tailored a plan to call in a coyote, but with a curiosity theme. I arrived plenty early and hiked well into the area in the dark with my dog Sage by my side. We had to wait about 15 minutes for shooting light. With its arrival, I howled a series imitating a pair of young coyotes conversing. The non-threatening message was followed by silence, and I sat patiently waiting for a vocal response or a coyote to appear. Neither occurred, which isn’t out of the ordinary in pressured parcels. After about 15 minutes or so, I added in a second curiosity factor. I switched on the sounds of crows gathering and followed with some magpie chatter. I continued the magpie squalls for several intermittent minutes after completing the crow dialect. The message here was to mimic birds scavenging, possibly on a kill. After approximately 30 minutes, I was still alone except for my dog and a few magpies that had gathered with interest. Thinking about a hot breakfast, I finished the set with another series of howls and scanned the landscape as the sun peaked over the horizon. That’s when I saw prying eyes! A coyote had appeared on a ridge to my right and was looking intently for the coyote clan in a reserved manner. Realizing the coyote was staring into the morning sun, I waited for it to make the first move. I often send Sage to distract the coyote, but with the sun factor and the coyote acting suspiciously, I held her at bay. Just then, the coyote turned to walk down the ridge and possibly out of sight. It took me only seconds to roll prone, and line up the reticle in my Nikon riflescope on the coyote. 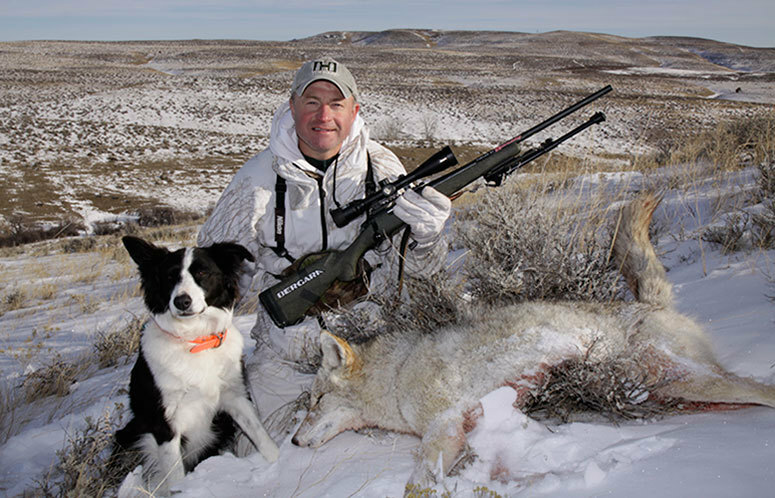 The trigger on my Bergara B-14 Hunter rifle depressed with ease and the coyote ate the Hornady SST bullet perfectly. It’s hard to walk away from a 6.5 Creedmoor encounter. If the coyotes in your zip code are already exhibiting paranoid behavior maybe it’s time to sideline the prey sounds for some curiosity. It seems to kill cats, and it work great on coyotes as I’ve discovered.